How are bats so manoeuvrable during flight? Bats use echolocation to create a 3D ‘image’ of their surrounding environment, but how do they fly so quickly and precisely – particularly in cluttered environments? How do they twist and turn in the air at the drop of a hat, to catch an insect or fly between branches? How do individuals of some species, like horseshoes, manage to twist their bodies sideways through the lines of a double-bank harp trap, and fly away with barely a ping of the wires? The answer lies in their bones and the structure of their wings. Bats are the only mammals that can truly fly, possibly one of their most remarkable characteristics considering their wings look very different to those of birds; indeed, the name of their order, Chiroptera, means ‘hand wing’. Nothing can explain this meaning more easily than when you look at a diagram of their bone structure. 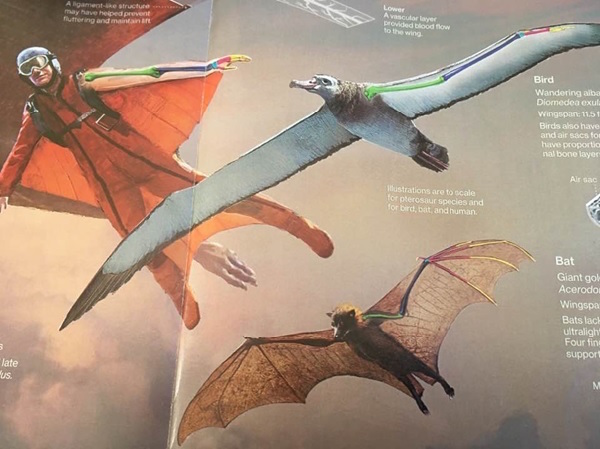 In November 2017, the National Geographic magazine included an article about Pterosaurs, with a section discussing how such a big creature could fly. As part of the article, there was a diagram comparing the bone structures of Pterosaurs, birds, humans, and bats. Part of this diagram is shown below, focusing on the latter three. 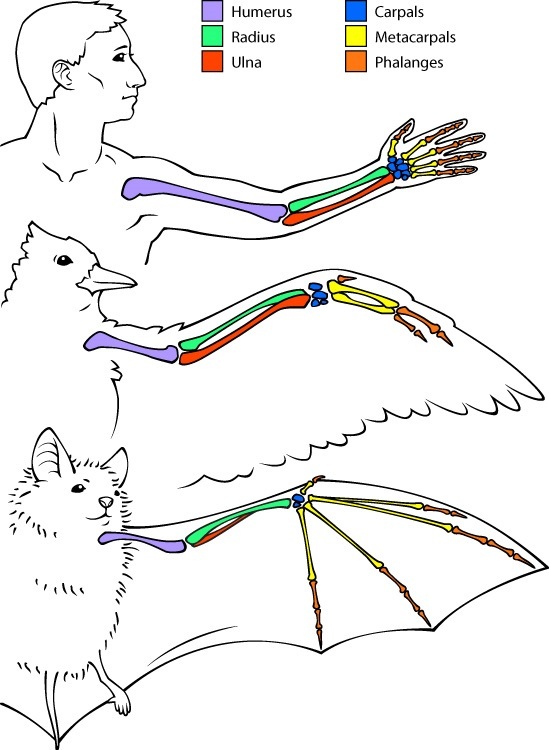 One thing that stands out, for me, is how similar the bone structures between humans and bats are; every joint that is in the human hand is also present in the wings of bats. It has been shown that genetically, bats are more closely related to humans than they are to rodents, despite having names like Fledermäuse, the German word for bats meaning ‘flying mouse’. This image (below) showing the bones in birds, humans, and bats is a little clearer, and also identifies the types of bones. The fact that birds, humans, and bats contain the same bones tell us that we all share a common ancestor. Bird wings have a fairly rigid bone structure, with the muscles responsible for flight moving the bones at the point where the wing connects to the body. This allows for more efficient lift, but the thin layer of skin, the patagium, between the ‘hand’ and the body of bats and between each finger bone, allows for much greater manoeuvrability. The wing bones of bats are longer and thinner than other mammals and may be mistaken for being fragile. However, while lighter to allow efficient flight, these bones are unusually rigid, being made of a denser material with the greatest diameter at points where the bending forces as a result of flight are the largest. 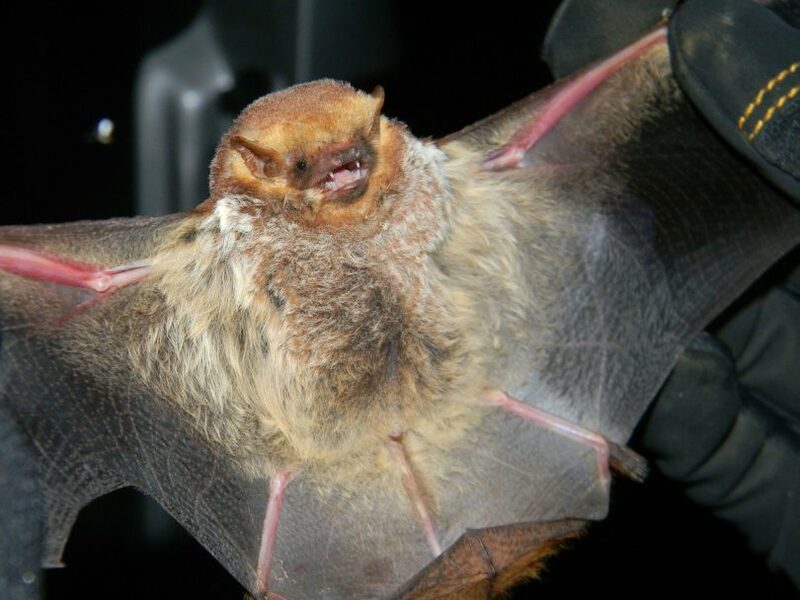 As a result, the bones in the wings of bats are much stronger than the bones of similar-sized rodents and non-flying mammals in general, allowing them to bear the stress of flight. Multiple joints within the wing (more than two dozen!) and strong elongated bones along with a flexible, elastic skin membrane and a complex network of muscles and stretchy tendons, create a shape-shifting structure that provides more lift, less drag, and greater manoeuvrability. As a result, bats can position their wings very precisely and with an extraordinary level of control into different shapes using the slightest movement of their muscles, changing the direction and degree of their flight very, very quickly. Altringham, J. D. (2011) Bats: From Evolution to Conservation. Oxford University Press, Oxford. Norberg, U.M (1970) Functional osteology and myology of the wing of Plecotus auritus Linnaeus (Chiroptera). Arkiv for Zoologi 22 483-543. About the Author: Rachel Bates (Castle Hill Ecology Ltd) is a freelance ecologist who finds bats particularly interesting and can often be found out with the local bat group when she isn’t carrying out bat surveys for work. She tries to combine her wanderlust with learning more about bats abroad when she can and has joined several overseas bat research trips to date. She does have a life outside of bats, enjoying hiking, photography, baking, and getting lost in fantasy fiction.